With Scorecards, you can easily monitor your most important metrics to keep track of your progress towards goals. Scorecards allow you to choose up to 10 KPIs and get Daily, Weekly, or Monthly updates via email, push notifications, or Slack. Log in to your Databox account. Click on “Notifications” in the menu at the top of the page. In the sub-menu click on “Scorecards” and then on the green button "Create my Scorecard". If you already have a Scorecard created, click on the "New Scorecard" button at the top right to create a new one. Next, set up and customize your Scorecard. Enter the Scorecard name and choose a background. Select up to 10 Metrics by from one or multiple Data Sources. Choose where you want to deliver the scorecard. Each Scorecard can be delivered to Email, Mobile and Slack (make sure that you have notifications enabled for email and slack in profile settings). Read more about connecting Slack. Delivery time: Choose delivery time for your incoming scorecard. Be careful to have the correct timezone selected. You can switch the delivery interval of each Scorecard to daily, weekly or monthly. You can also select the desired date range for selected metrics. Change it in the drop-down next to "Show data for". Click on "Save" to update and activate scorecard settings. You can also send a preview by clicking on "Send a preview" before you save the scorecard. The scorecard will be sent to your mobile device. With selecting the option "Save as Default" on the bottom right you can create a default Scorecard for all users in this specific account that don't have their personal Scorecard setup yet. All settings (selected metrics and delivering options) from your Scorecard will be also applied for other users. If an Agency user logs into an Client account and saves the Scorecard as default, it will create a Scorecard for the Agency user and for all other users in this specific Client account. 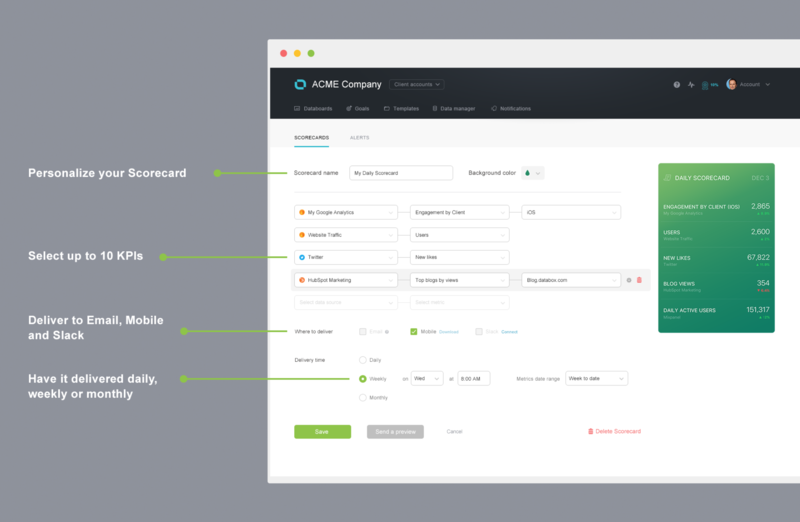 It won't create a Scorecard for Agency Users who have access to that Client Account. Watch a demo of how to set up a Scorecard below. Why is my progress towards reaching a Goal not showing up for certain Date Ranges?